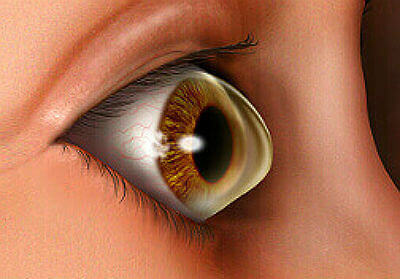 Home » Posts » Blogs » What is Keratoconus and How Does it Affect Laser Eye Surgery? What is Keratoconus and How Does it Affect Laser Eye Surgery? One of the reasons a surgeon advises their patient to wait until they are 21 to have laser eye surgery is that they want to make sure they do not have keratoconus. Keratoconus is a genetic condition, which usually develops between a person’s teenage years and early adulthood. As it is most likely to arise before you turn 21, that age is seen as the optimum age to safely carry out laser eye surgery. Understanding more about how this condition affects your surgery prospects is useful if you suffer from it, or you are experiencing symptoms associated with it. What is Keratoconus and what are the signs of it? At the front of your eye is a clear window called the cornea, which plays an essential role in focusing images in the form of light waves onto the retina at the back of your eye. If you have keratoconus, the stromal layers of your cornea are weak. This causes the cornea to become dome shaped, as it is not strong enough to prevent the contents of the eyes from forcing it to bulge. If you are experiencing these symptoms and you have not had a diagnosis yet, don’t write off laser eye surgery entirely. These symptoms are associated with other conditions too, which means a full diagnosis is required before you make a decision about your surgery. Who is at risk of Keratoconus? Nobody knows for sure why keratoconus develops. One theory is that persons who suffer from an allergy are more likely to poke and touch their eyes, which causes damage to the cornea. Eye rubbing is commonly associated with Keratoconus. It is also linked with some genetic conditions, such as Down’s Syndrome, Marfan Syndrome and Turner Syndrome. One of the clearest links between a lifestyle habit and kerataconus is poor eye hygiene. Ensuring you always wash your hands after they come into contact with anything dirty can reduce your risk of developing the condition. Can you have Laser Eye Surgery if you have Keratoconus? After a keratoconus diagnosis, laser eye surgery is not recommended. As the cornea is already weak, there is a risk that surgery could weaken it further. Various experts recommend that persons who suffer from this condition do not have LASIK. As such, seeking a consultation with am eye surgeon is important before making any decisions about your vision. There are keratoconus-friendly alternatives. Keratoconus cross linking and INTACS are non-laser procedures. Using cross linking, a surgeon can encourage riboflavin production to strengthen the cornea. INTACS uses stormal inserts to flatten the cornea a little. Upon consulting with a surgeon, you may find that cross linking, INTACS or a combination of the two procedures can improve your visual outlook with keratoconus. If you would like to find out more about Keratoconus treatments at Advanced Vision Care and how they can completely transform your life, then why not call AVC TODAY on 0800 652 4878 and request your free information pack or book your consultation to find out how we can help you.